Replaces Pukka Turmeric - Improved Formulation! 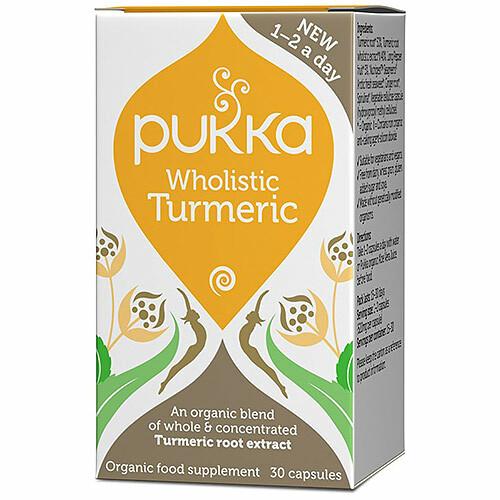 Pukka Wholistic Turmeric is a concentration of the finest parts of whole turmeric root gathered from fertile organic soils. Enhances liver functions, acts as an anti-inflammatory and promotes cellular protection. 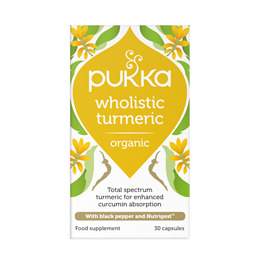 Pukka Herbs produces and supplies award-winning organic herbal teas and remedies blended by master herbalist Sebastian Pole. 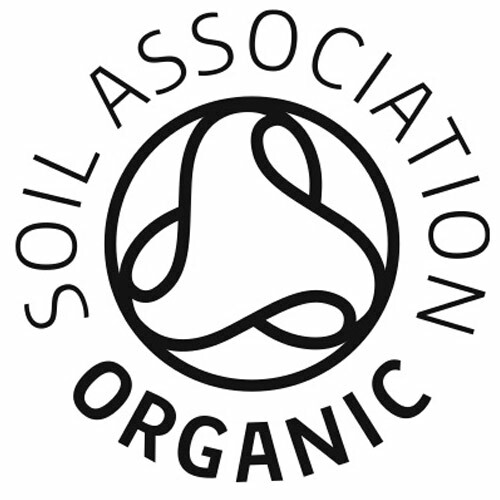 Founded in 2002, Pukka Herbs is based on the principles of Ayurveda – the ancient Indian art of living wisely - and has been a repeated winner at the Great Taste, Soil Association and Natural & Organic Products awards. Turmeric root* 50%, Turmeric root wholistic extract*^ 40%, Long Pepper fruit* 5%, Nutrigest Seagreens Arctic fresh seaweed*, Ginger root*, Spirulina*, Vegetable cellulose capsule (hydroxypropyl methyl cellulose). ^ Contains non organic anti-caking agent - silicon dioxide. Take 1-2 vegicaps a day with water or with Pukka Organic Aloe Vera Juice before food. Below are reviews of Pukka Organic Wholistic Turmeric - 30 Vegicaps by bodykind customers. If you have tried this product we'd love to hear what you think so please leave a review. Good, natural and powerful combination!